Okay you know the rules. It's time to tackle chess strategy. How to mold your individual pieces into a single fighting machine. The opening, the middlegame and the endgame are by their nature different beasts. Your objectives will shift somewhat throughout the game. Playing through an entire game requires a knowledge of various themes and concepts to deal with different challenges. The opening consists of the first 10 or 12 moves. You and your opponent will develop your pieces and prepare for the oncoming war. 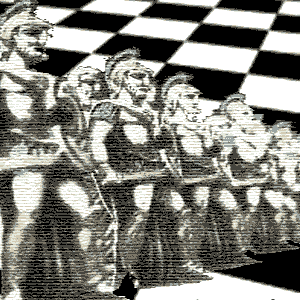 The middlegame is the central phase of the game that contains the struggle for the upper hand. The endgame is the final part of the game as the last remaining pieces try to push on for victory. You can upload a tip or hint of your own. I'm not sure if such a game has ever been played. It's not easy to imagine that anyone could fall into this trap and lose so quickly. After all, the moves (all two of them!) serve no purpose for the player making them other than to facilitate his own demise. So I am confident that you will never fall victim to a loss in just two moves. The only thing that can be said about any game that sees the moves: 1.f3 e5 2.g4 Qh4# is that it is a cautionary tale. It shows us that if we play poorly enough we can lose very quickly. We must make good moves from the start if we want to survive into the middlegame and endgame. We can see the proof of the pudding in the quickest possible checkmate in chess: fool's mate. For further emphasis a discussion of Scholar's Mate (4 move checkmate) will follow. Sometimes every now and again you will reach an endgame with no pawns. This is rare enough but it happens. In this case the stronger side must look for victory with his remaining pieces. A King and Queen can force mate against a lone King as can a King and Rook. Two Bishops are also enough to finish the job. A Bishop and Knight also win in a more complicated pattern. Alas two Knights are not quite powerful enough to finish off a lone King. He can only fall to them with very dubious play. Interestingly if that King has a pawn remaining on the board it will prove his undoing as it will eliminate stalemate possibilities and the Knights will then win. The technique in these basic checkmates are most instructive. The middlegame is the portion of the game that directly follows the opening and forms the prelude to the endgame. You must strengthen your position and in doing so undermine that of your opponent. Attention should be both given to the orchestration of positional superiority and the possibility of profit by way of two to three move tactical maneuvers. The opening is generally thought to be over when the minor pieces have been developed, both sides have castled and the Rooks and Queens have been stationed at deep positions behind the battle lines. The dividing line between the middlegame and the endgame is when the pieces have mostly been removed. So the middlegame is the contest for supremacy leading into the endgame. Positional principles are the bedrock of good technique. You have to get your pieces and pawns working together in a cohesive and harmonious way. That way their combined power can be magnified. The pawn shell will do more than anything to determine what your game plan should be. You will identify holes and weak points in your opponent's camp that can become the focus of attack. You will also take care to mitigate your own weaknesses and develop defensive resources to see off any potential attack. Your Knights will find outposts, your Bishops will find good diagonals and your Rooks will take command of key open or half open files. Your Queen will find a safe spot from where she can both defend and attack. One of the keys to success is learning the craft of positional chess. Chess Strategy: Tactics can make you or break you - White wins material with 25.Bc6! There is an old saying: Chess is 99% tactics. Tactics are certainly very important for forcing material or strategic gain. The positional awareness of players ranging across several classes may not actually be that great. Positional play is very important but is relatively easy to learn and implement. It will be integrated into the opening lines that you study. These principles will guide you into the middlegame. So while most people can get a reasonable handle on positional play it is chess tactics that sorts the men from the boys. Don't worry too much about memorizing the moves. Your new understanding of the logic behind the maneuvers should help you out. Let's just get a taster for these opening systems and the basic thinking behind them. When any player has played a couple of hundred chess games he will begin to come to grips with the nature of the game. He will start to see threats before they materialize. He will begin to comprehend that he must use the combined strength of his pieces to overcome his opponent. But how? Of course a lot of players will reach a competent level in time. But how long will it take? A quicker route to the right road is to follow the beaten path of those who have gone before. Here you'll find time tested opening strategy. That's a good primer on chess strategy. Your thirst for more knowledge of chess strategy should never be satisfied. Hopefully the first building blocks are in place and you're now thinking the along the right lines. Get further grounding in chess strategy tips and beginner's ideas. It can only strengthen your game. And remember you can upload a tip or hint yourself. You will develop your own style as your chess skills grow. When you discover the kind of chess you enjoy playing, you'll play for those games time and again. Share tips and tricks or pick some up by checking out chess moves that rock. The kind of games you get into regularly will depend on the opening repertoire you build. Browse through all of the openings in the ECO Index to see which ones you like.